1 Tourist Attractions / What to see in Marrakech ? Tourist Attractions / What to see in Marrakech ? Marrakech, called the red city or the pearl of the south of morocco, is an exciting and lively destination. The red city offers a beautiful scenery and fascinating architecture. It has a a lots of interesting places that will not make you hesitate twice when you have to take your plane tickets to visit this city. To organize your stay more easily, we have listed for you the best things to do in Marrakech. So, to be sure not to miss anything in the city ? Follow the guide bellow ! Marrakech visit begins with the exploration of the Jemaa-el-Fna Place late afternoon where we can meet among others snake charmers. It is the center of the city, where every evening, tourists and locals meet to enjoy the atmosphere. You can also see the Koutoubia Mosque located near Jemaa-el-Fna Place and whose minaret overlooks the surroundings. You will not miss either the Ben-Youssef Madrasa, a Koranic school whose architecture is breathtaking. Away from the hustle and bustle of Marrakech, stroll through the romantic Menara Gardens between olive groves and ponds. If you love the Moroccan style, maybe you’ll end up with a the Bahia Palace visit. 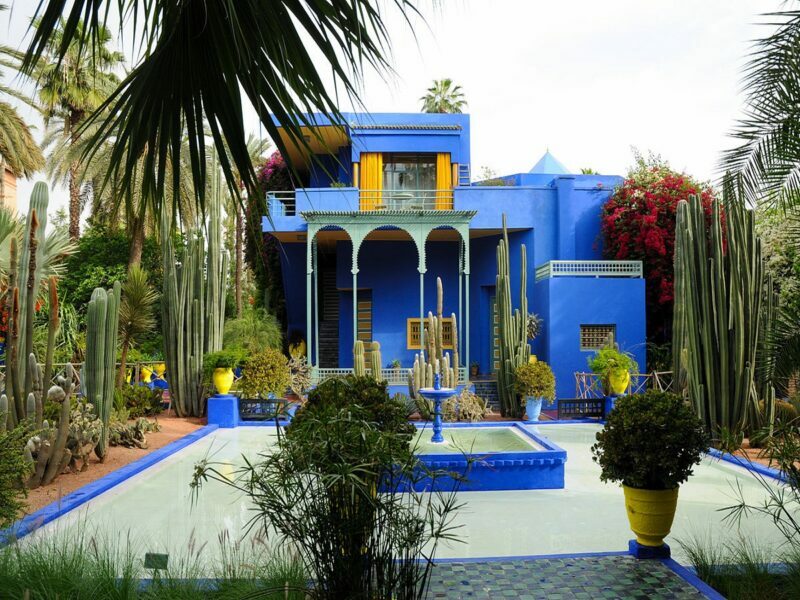 Majorelle Garden, botanical garden with blue colors, is unmissable in the new city. The garden belonged to a fashion designer Yves Saint Laurent and when he died in 2008, his ashes were scattered in the garden. 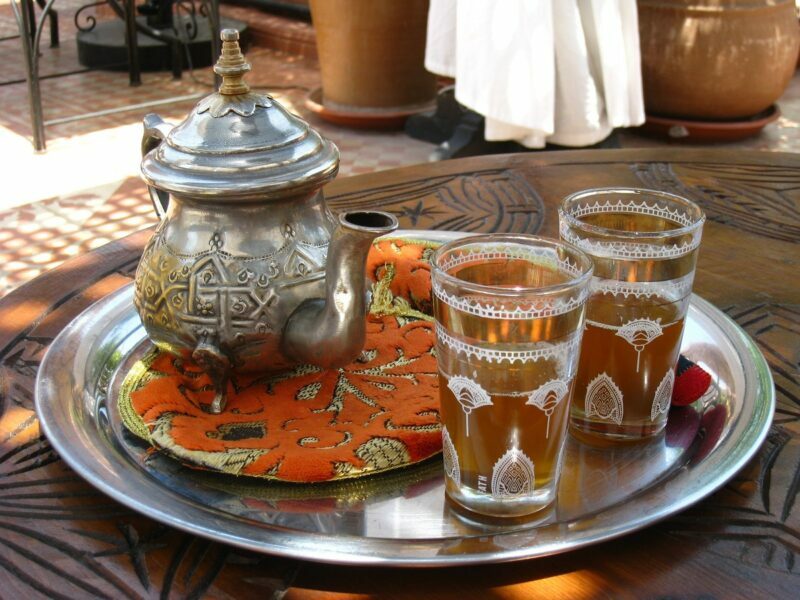 The moroccan tea is delicious and you will not feel tired of it. During the hot season, you can refresh yourself with some healthy Moroccan Mint Tea. 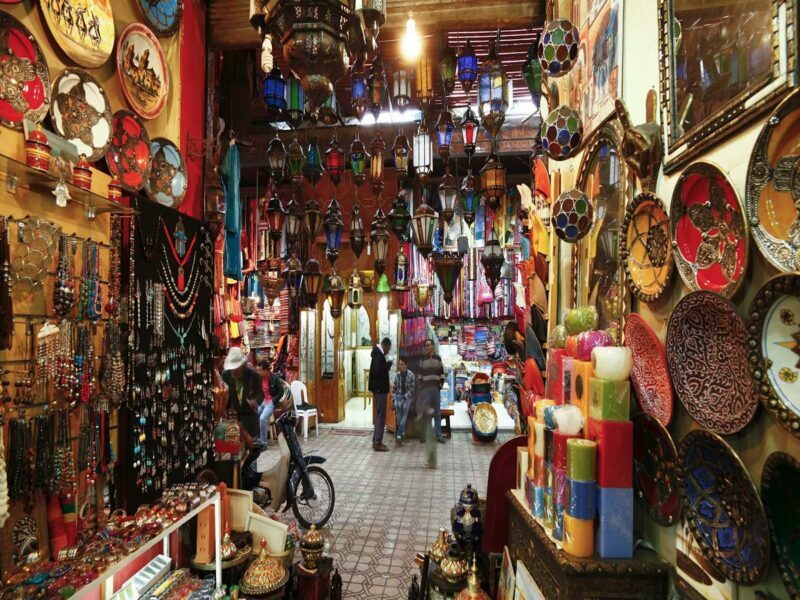 First of all, haggling is commun in morocco especialy in souks witch are ideal to get a good deal. But, you must be willing to haggle to get a good price. 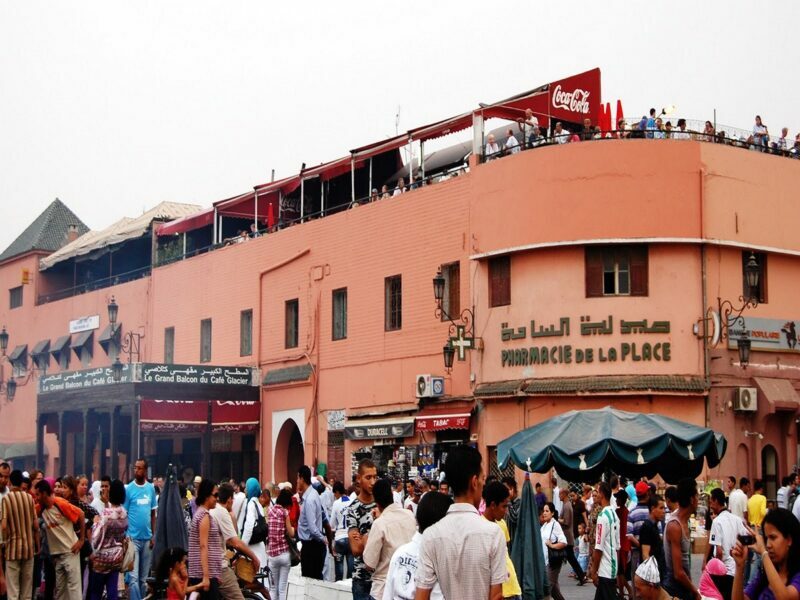 If you like to relax and watch people go by from the rooftops, there are many terraces on the rooftops of Marrakech. So, you can have a sit there, drink something and keeping an eye on what’s going on down. 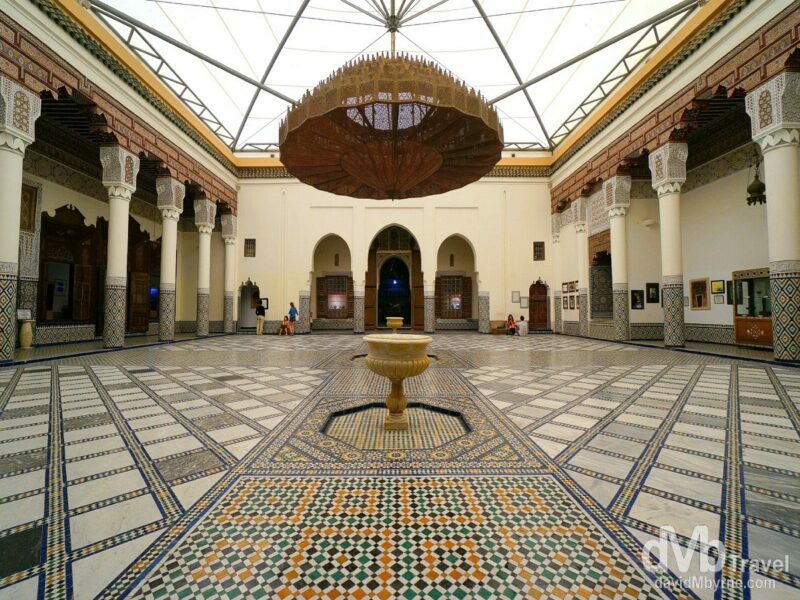 In addition to learn about Marrakech city history, you have to visit museums. It will give you the opportunity to enjoy one of the most beautiful architectures of the red city. In the center of Marrakech, there is a museum in Dar Mnebhi Palace ( see picture above ). The palace was built at the end of the 19th century and is a perfect example of classical Andalusian architecture. 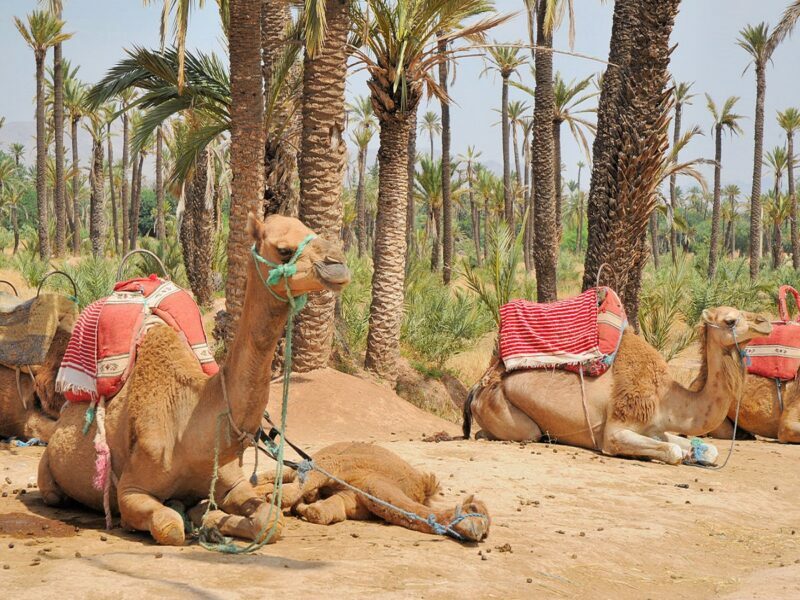 Exploring The Palmeraie of Marrakech ( Palm Groves ) is possible by riding a camel or during a quad ride. On about 15,000 hectares, The Palmeraie of Marrakech has more than 100,000 trees, mainly palm trees as well as a production of dates and a kitchen garden. You can get to Atlas Mountains in few hours drive from Marrakech. While you are in Marrakech, you have to go there. 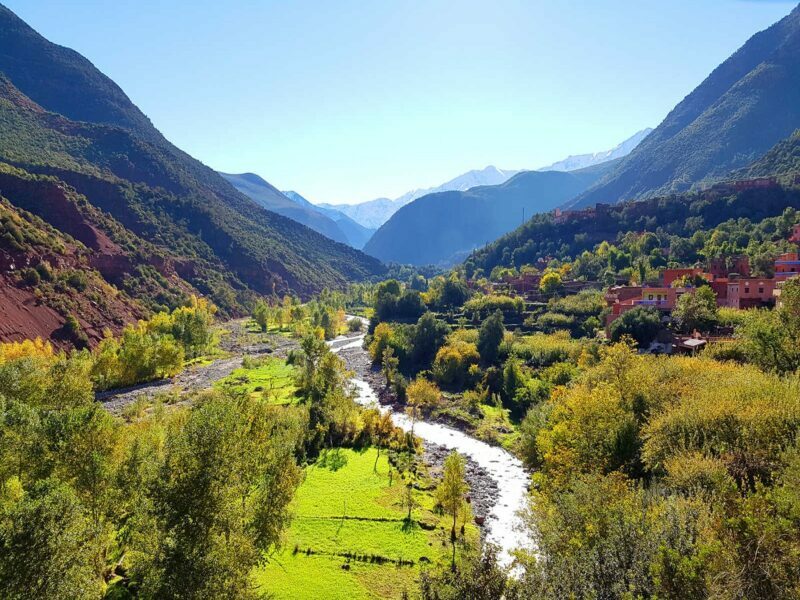 Going to Atlas Mountains is well worth a day trip because the view from the mountains is superb. When you are there, over rivers flowing on the slopes of the mountain, you will cross small bridges. Also, The temperature may drop, so bring a jacket or sweater and suitable shoes for mountains. Traditional markets : you can discover many popular markets like the one of Ourika ( Monday market ), Aghbalou ( Thursday market ). In case you arrive in the valley from mountains, there is the one of Tahanout ( Thuesday ) and Asni ( Saturday ). 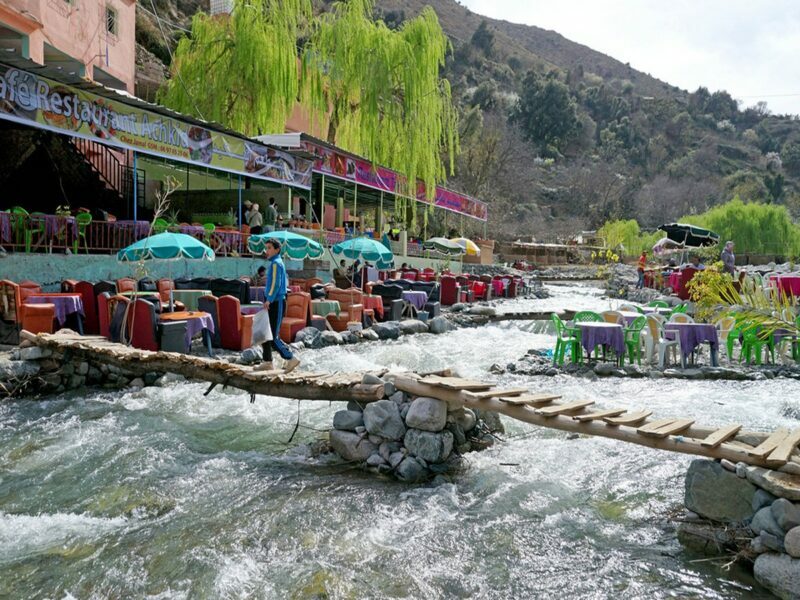 When you arrive to Setti-Fatma for example, it is easy to find a local tour guide and from this village, there are excursions organized to see Ourika waterfalls. 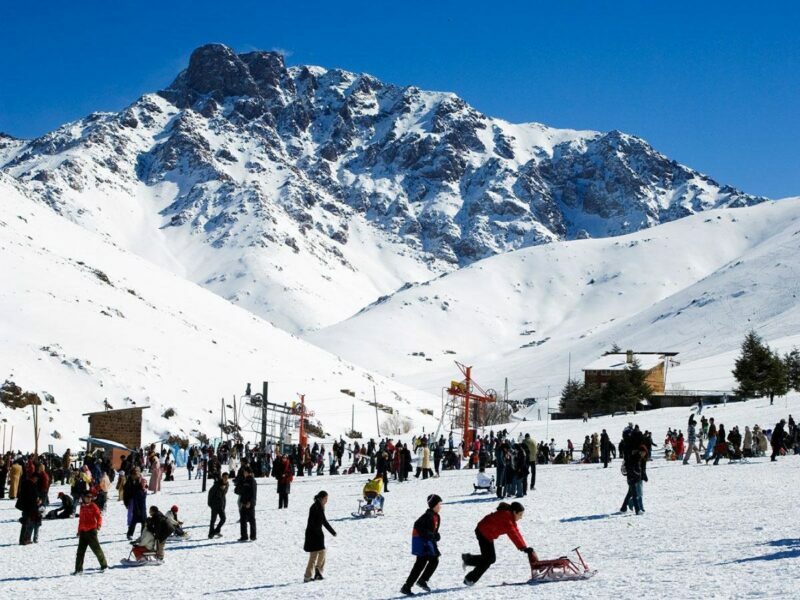 Oukaïmeden is 75 km from Marrakech and its summit is 3200 meters. The ski area is between 2,500 and 3,200 meters above sea level. For persons interested in skiing, it is better to go from December to March or April to enjoy quality snow. This area also offers many attractions and during the summer, you can admire beautiful nature and rock carvings. 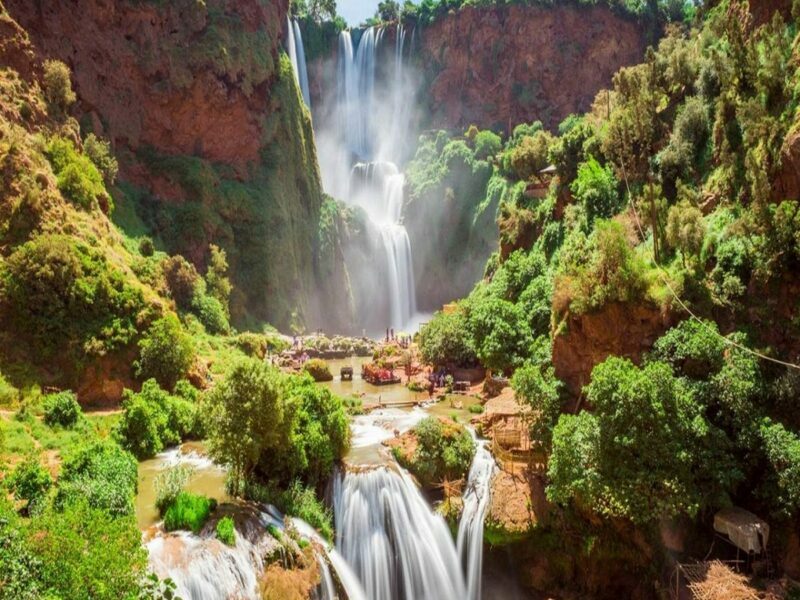 Ouzoud waterfalls are located 150 kilometers in the north of Marrakech and are the largest and most beautiful in Morocco. At a height of 110 meters, the waterfalls dominate a wild nature made of olivre, fig and almond trees. Moroccans and tourists go there to get fresh air and enjoy this bucolic atmosphere and landscape. Ouzoud waterfalls are reached by small paths and once you are at the foot of the falls, you will have the opportunity to ride in a small boat to be closer to the waterfalls. In addition, in the foot of the falls, there are small restaurants and you can have lunch with a breathtaking view of the waterfalls.